Another in the series on capturing super suns juxtaposed on iconic or otherwise interesting subjects. I’ve been keeping an eye on this location for awhile on Suncalc.net. Waiting for the right time, weather, and my own availability. For this shot i was leaning towards the preference of having no clouds at all. Most of the time i pefer to have some clouds sprinkled about, or even interfering with the shot somewhat. But a clear sky is the safer bet, and in this case i preferred to have it as such. The conditions were very cold and windy. I packed a bracket which allowed me to attach a lens support to further reduce camera shake. Planning not enough ahead, i was in a rush to get to the location. Tossing everything into the car and venturing off toward Brooklyn. The spot is along the newly redeveloped waterfront south of the Brooklyn bridge, which has a lovely view of south manhattan, the harbor, and of course: Lady Liberty. For the timelapse, my subject is actually not very tall, relative to something like the empire state building, but nonetheless there is some calculation/guesswork as to where i need to be to get the sun to pass right where i want it. Using apps and websites to see where the sun will set is a first step, but for this shot it’s not about where the sun is setting, it’s about where it will cross paths with parts of the statue. Trotting up to the entrance to the general area, i see the sun much farther over than i had hoped, and lower as well. Thankfully i had a good amount of area to scour. A brisk jog commenced down the pathway, watching the statue slowly change relative position to the sun. Pro tip: Always keep in mind: You cannot move the sun. If you’re trying to get the sun behind an object, you must alter your position relative to the object. So, if you see the sun is to the left of the object and you want to move it behind the object, your instinct may be to move to the left. Wrong. Since the sun is the fixed variable(well, the most fixed), you must move to the right, changing your relative position to the object. It couldn’t get any more on the edge. Today would have been the last day for such a shot from this vantage point. As i set up the timelapse, i notice an unexpected benefit to the precarious timing: the edge of the next pier lines up into the foreground of my shot. There are a few people meandering around. As i initiate the timelapse, i see potential unfolding: There is one fellow who is hanging around, taking pictures of the same sunset. Looking through the images, it’s clear the timelapse would have issues, the wind blew strongly right as the sun touched the torch. It took a lot of playing around and removing frames to find a workable lapse, but it was worth it. 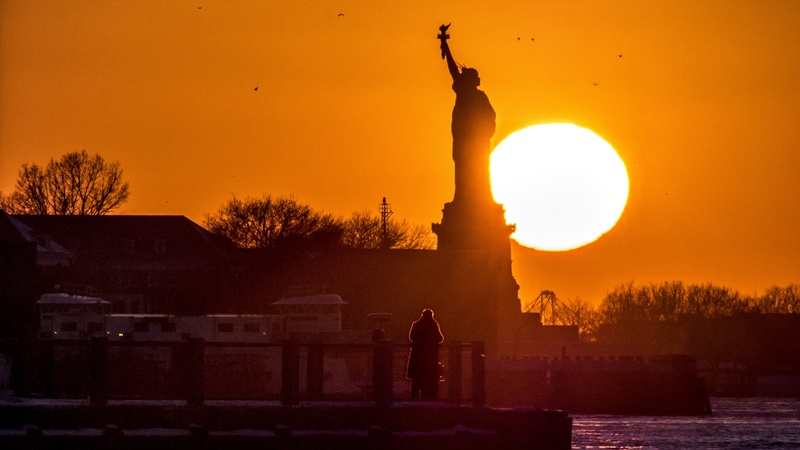 In picking out my favorite frame, the ideal for the sun and liberty would have been right as the sun is behind her head and outstretched arm, and that is certainly a nice shot. But i was keeping an eye on our meandering fellow. Sure enough, frame by frame, he positioned himself, and the moment occurred where the sun and liberty and the fellow were in a pleasing alignment with one another.